← I cannot believe it’s been a YEAR!!! These posters are old news, but I had to laugh at this today. And yes, I read your blog. I’m getting a little bored with the way I have been blogging for the past few years. I feel like I need to spice it up like an old lady who bedazzles her fanny pack. Not sure how, but I want to. Maybe more vlogs. Maybe more pictures of me with the Optimus Prime helmet. Maybe I’ll bake you a pie and then eat it for you cause you are way over there. The great and awful thing about personal little hobbies like blogging is this: Your friends are going to tell you they LOVE your blog…or painting or whatever you are doing. They do this cause they are nice, and you should feel lucky to have such nice friends. So, I am going to change things a bit. Not today, and not next week. Probably the week after. September seems like a good time to start. And before then, I vow to clean the smooshed moths off my computer screen that terrorize me at night when the glow of the laptop is the only light in the house. 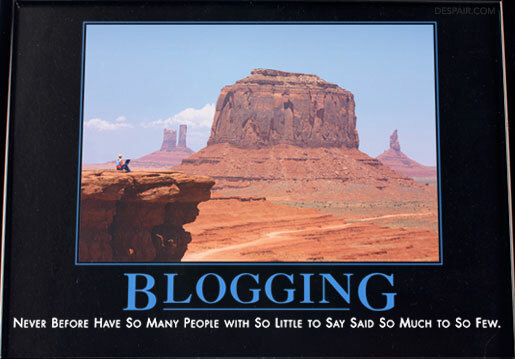 Blogging is the new prayer, I don’t know how many people are aware of this fact. At the same time and for that very reason I think we definitely need to *do something about it*. “Very well, then! of that sort only are my readers, my true readers, my readers foreordained: of what account are the rest?–The rest are merely humanity.” — Nietzsche, “The Antichrist”.